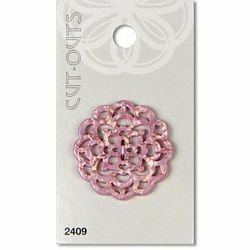 1 3/8" (34mm) Pink Cut Out Pearlized Button - These Pearlized buttons have intricate design cut outs. Inspired by various ethnic cultures. Add some intrigue to your craft and sewing projects.